Picasso Orthotics™ | Marathon Orthotics, Inc.
Click Here to view all available styles. Picasso Orthotics™ offer your patients something entirely unique. Our innovative flash painting technique results in custom designed Co-Poly and Polypropylene orthotics that are truly stunning! Keep in mind these are still the same handcrafted orthotics you have always ordered from Marathon Orthotics, Inc. They are made with the utmost care in our lab, by our lab technicians. 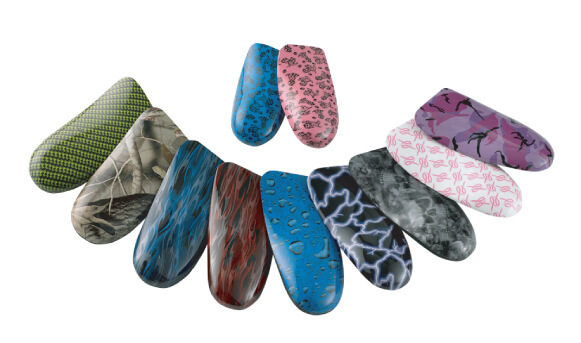 Picasso Orthotics™ take fun and color to the next level by offering 11 unique patterns that can be flash painted onto the orthotic shell itself. We are the only orthotic company in the US with this amazing new technology.